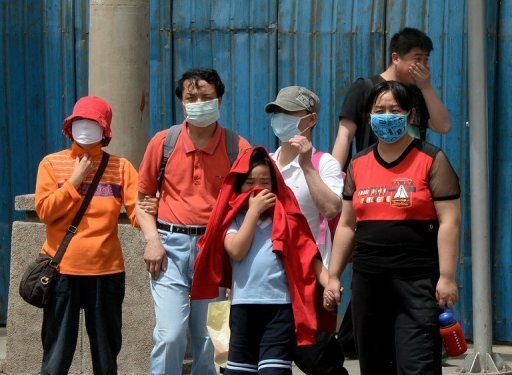 People wear masks to protect against air pollution and dust in Beijing on May 19, 2013. BEIJING (AFP) – (AFP) – China vowed Thursday to reduce levels of atmospheric pollutants in Beijing and other major cities by as much as 25 percent to try to improve their dire air quality. China’s State Council, or cabinet, said “concentrations of fine particles” in the capital’s air will fall by “approximately 25 percent” from 2012 levels by 2017. Other major Chinese cities on China’s affluent east coast, including Shanghai and Guangzhou, will see reductions of between 10 and 20 percent from 2012 levels over the same period, said a plan posted on the central government’s website. Cities across China have been hit by intense air pollution in recent years, much of it caused by emissions from coal-burning power stations, with levels of small particles known as PM2.5 reaching as high as 40 times World Health Organization (WHO) limits this year. The pollution has been linked to hundreds of thousands of premature deaths, and has tarnished the image of Chinese cities including Beijing, which saw an almost 15 percent drop in tourist visits during the first half of this year. The plan said pollution levels would be cut by slowing the growth of coal consumption, so that its share of China’s total energy consumption falls to 65 percent by 2017. China relied on coal for 67 percent of its energy needs last year, environmental group the World Wide Fund for Nature (WWF) said in a statement. “We call on the Chinese government to set a more positive target, to more strictly limit coal consumption,” WWF China’s climate and energy project manager Lu Lunyan said in the statement. China is the world’s biggest coal consumer and is forecast to account for more than half of global demand next year. Three of China’s most populated coastal regions — including the areas surrounding Shanghai, Beijing, and the manufacturing hub of the Pearl River delta — should “strive to achieve a reduction in total consumption of coal”, the plan said. But it did not state any precise targets for reductions, and activists gave the proposals a mixed assessment. The plan “takes very important steps” towards controlling rapid growth in coal consumption, said Li Yan, climate and energy campaign manager at Greenpeace East Asia. But to reduce air pollution significantly “it will be necessary to limit coal consumption in other areas as well”, she said in a statement. The plan did not call for cuts in coal consumption in China’s vast inland provinces, which researchers earlier this year said are responsible for 80 percent of China’s carbon dioxide emissions, mostly as a result of coal-burning. China’s coastal areas are “outsourcing” pollution internally to meet emissions reduction targets, researchers wrote in the Proceedings of the National Academy of Sciences this June.